My first MiniArt review! Are these crude,a more-of-the-same-thing set, or a set with great value and very refreshing? Find out! I quite like the MiniArt boxes. I love the mega-detailed style, with all the chrome plated knights beautifully drawn. The blue surrounding perhaps looks a bit cheap, but the artwork, is just the best style possible, in my opinion, to make you buy a set of figures. The only bad thing? Maybe that it is too nice, and some figures are not exactly the same, specially the leader. On the back, the two knights shown are just not given at all, and they claim they give "48 figures", which is incorrect, as you get 36 figures and 16 horses. The detail isn't super sharp, or very well defined, but overall these figures look very nice. They are big, but not too big, and very well proportioned. They are in active poses, yet not completely charging or attacking and still look good waiting or moving to attack. The horses are different and represent heavy medieval horses very well. The principal bad point here is that some of the mounted knights have very basic detail, and some faces and other details are utterly lost where the mould closes. The shields fit well and are perfectly sculptured. One of the mounted knights has his arm separate, to achieve a full charging pose which is usually avoided by manufacturers due to its complexity. It is remarkable that MiniArt tries this without having very good moulding skill, and you get a very lifelike figure , but the arm is a bit small and fits leaving somewhat of a gap. This MiniArt set is one of their best, and you can't find flash anywhere. I don't know if this is the case in all sets, I think yes. But I have other MiniArt sets with lots of flash and missing detail, yet there are some people that have got them with good detail, so be careful ,and if you can take a look at the figures before buying them all the better, or asking the seller if the purchase is online. The historical accuracy is perfect here. This set is labelled as XV century, you could argue that some of them look more XIII century, but all the same they can be ok. 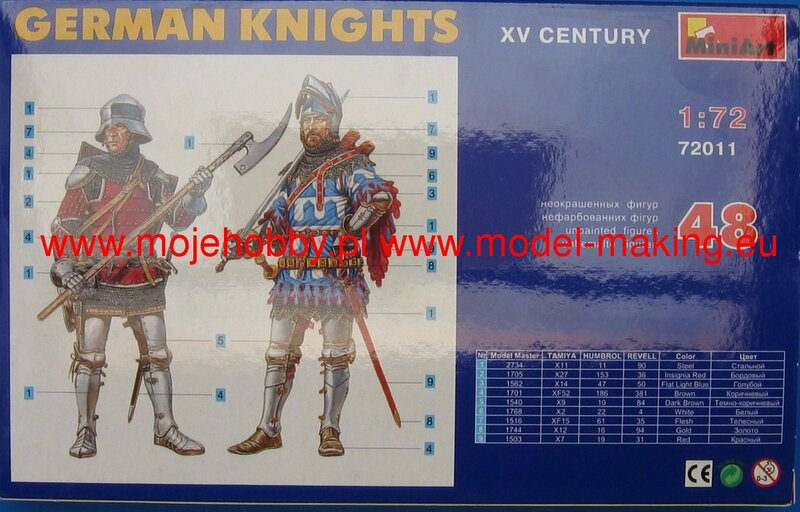 They are sold as Knights, even if three of the unmounted troops don't look very knightly to me, more like armoured sergeants or just heavy professional infantry of the time, but nevertheless this doesn't affect the set. They have been made basically to confront the Hussites (well, although MiniArt has other XV century sets), but I don't think they are ideal to do the job, they seem a bit too early, but as there isn't anything better they'll have to do. They were made at the same time as the Hussites, although in my model shop the Hussites arrived much later. You would need to represent a good army regular infantry, but it is supposed that this is left to generic Medieval sets. Any Medieval european set is great to represent different armies, and this even more as they don't have any banner nor special german design. So the possibilities are vast; late Spanish kingdoms, French, Danish, English, Polish, Hungarian and obviously the myriad of different electorates of the Holy Roman Empire. Your paintbrush and your imagination is the only barrier . Without giving any leader nor man doing a special thing, they are all in nice fighting poses, and weapons clearly defined, not blended to the body like others. As with many others, they don't have any unique figure, you are just given one figure resembling a noble or leader, and you will have to get rid of his three brothers, trimming the headgear and maybe changing the weapon or the head pose. You don't have a standard bearer either, although one can be obtained very easily by modifying the man holding up the lance. As they represent just a body of an army, the absence of certain types of soldiers is permissible. 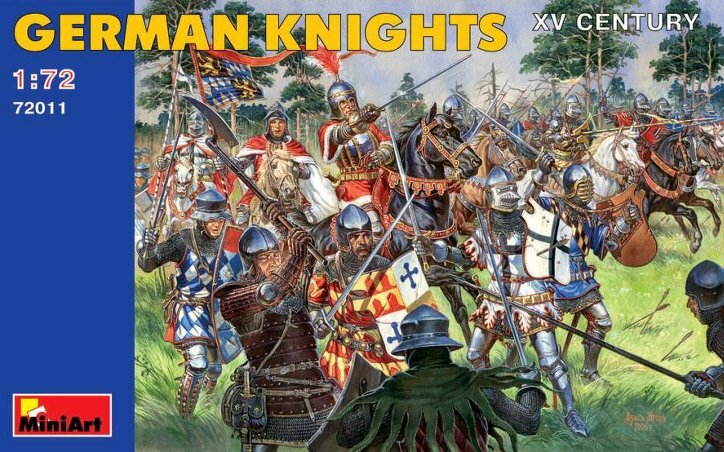 The quantities of 16 mounted knights and 20 infantrymen will please the wargamers and everybody that likes be given a lot for their money. I was quite surprised when I opened the box and instead of 48 infantrymen horses kept coming from out of the box! instead of 48 figures, which the box claims, you get 16 mounted knights and 20 infantrymen, which is 52 "figures" (counting the horses). Knowing that HaT will sell you 12 cavalrymen alone for 8 € or 10 €, and you can get this set for 10 € shipped, the price/value is extremely good.